Las Vegas’ premiere skydiving attraction! Imagine yourself thousands of feet in the air, staring out over beautiful desert vistas. Above you, nothing but sky. Below, breathtaking mountains and the impending leap followed by the indescribable descent to the earth in one of the most thrilling experiences known to mankind. This is skydiving and GoJump Skydiving invites you to take the plunge and experience the ultimate thrill. The sky is waiting, it’s time you and your group took excitement to the next level, and embark on the ultimate thrill. No ground-based attraction or ride can compare to the intense thrill of jumping out of a plane and weightlessly falling to the earth from tens of thousands of feet in the air. 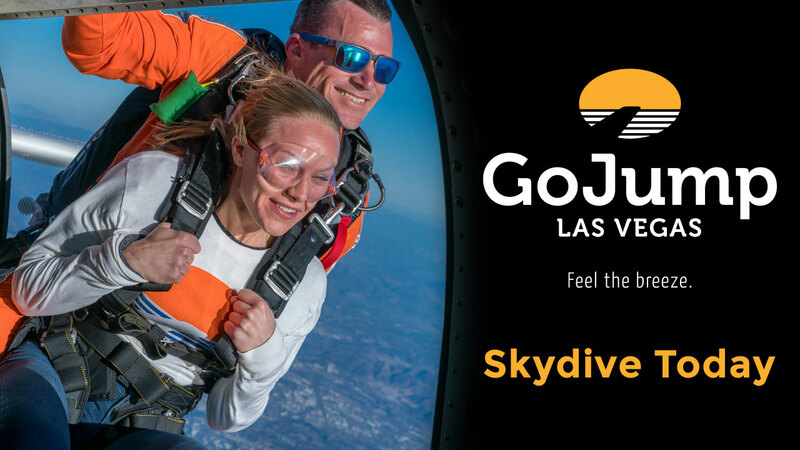 It’s breathtaking, amazing, and absolutely safe – and it’s waiting for you at Las Vegas’ premiere skydiving experience – GoJump Skydiving!